The Unification Ministry on Tuesday gave the green light for students of Seoul National University to contact students of Kim Il Sung University, North Korea's most prestigious school of higher learning, to discuss academic exchanges, the South Korean university's students said. The approval, coming amid increasingly warming ties between the two Koreas, could pave the way for the school's first student exchanges with a North Korean university since its foundation in 1946. 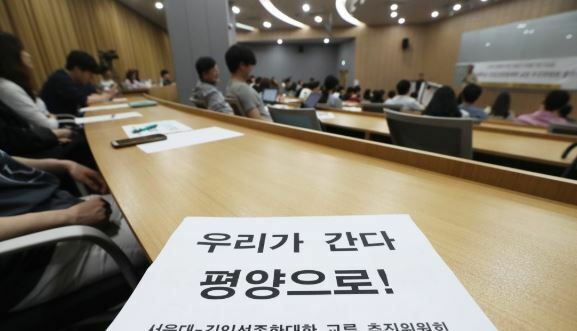 The SNU students, who have launched a promotion committee for inter-Korean exchanges together with the university's student council, filed the request with the South Korean ministry on May 24. After the ministry, which handles inter-Korean affairs, approved its plan, the SNU committee said it will send a fax message to the Pyongyang-based Kim Il Sung University as early as next week to begin discussions on student exchanges. The committee plans to reveal the content of the message during an event at the school on Friday to mark the 18th anniversary of the historic first inter-Korean summit in 2000. In the message, the committee is expected to propose SNU students make a visit to Kim Il Sung University and look for various exchange programs, including joint exploration of historical sites in Pyongyang by students from both universities.